26 October to 16 December 2018. 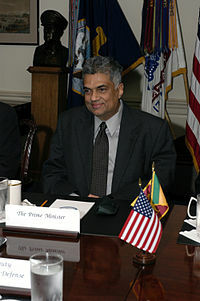 Wickremesinghe also previously served as Prime Minister from 1993 to 1994 and 2001 to 2004. He was appointed party leader in November 1994 following the assassination of Gamini Dissanayake during the campaign for the 1994 presidential election. On 8 January 2015, Wickremesinghe was appointed as prime minister by President Maithripala Sirisena, who had defeated President Mahinda Rajapaksa in the 2015 presidential election. Wickremesinghe's coalition alliance, the United National Front for Good Governance, won the 2015 parliamentary election with 106 seats. Although it fell short of an outright majority, Wickremesinghe was re-elected as Prime Minister with over 35 Sri Lanka Freedom Party members joining his cabinet. Wickremesinghe was removed as Prime Minister on 26 October 2018 by President Maithripala Sirisena with the appointment of former President Mahinda Rajapaksa as the Prime Minister, which Wickremesinghe has claimed unconstitutional and refused to accept, resulting in a constitutional crisis. The constitutional crisis ended with Sirisena re-appointing Wickremesinghe as Prime Minister on 16 December 2018. Born on 24 March 1949 in Colombo, Wickremasinghe is the second son of Esmond Wickremesinghe and Nalini Wickremesinghe née Wijewardena. His father was an ex-Samasamajist lawyer who became a press baron taking over the Lake House Group of newspapers. His grandfathers were Cyril Wickremesinghe and D. R.Wijewardhena. Wickremesinghe was educated at Royal College, Colombo where he was a classmate and friend of Anura Bandaranaike, son of then Prime Minister Solomon Bandaranaike and Dinesh Gunawardena, son of socialist leader Philip Gunawardena. Wickremasinghe entered the Faculty of Law at the University of Ceylon, Colombo campus (now University of Colombo). After graduation, he completed the law exams at the Sri Lanka Law College and took oaths as an advocate in 1972. Wickramasinghe received an honorary doctorate from Deakin University in Australia on February 14, 2017, for his significant contributions in reforms in economy, education and human rights. Wickremasinghe joined the United National Party (UNP) and progressed through its ranks. He was appointed as the chief organizer of the Kelaniya Electorate in the mid-1970s but was later appointed as the chief organizer of the Biyagama Electorate, which he won in the 1977 parliamentary elections. He was appointed Deputy Minister of Foreign Affairs in the new government of J. R. Jayewardene, and was soon promoted to the post of Minister of Youth Affairs and Employment, which made him the youngest cabinet minister of Sri Lanka. During his term as deputy minister, he initiated the Sri Lanka National Guard and the National Youth Services Council (NYSCO), which provides vocational and career training to school leavers. Wickremesinghe was later made the Minister of Education. Under the Presidency of Ranasinghe Premadasa, Wickremasinghe was appointed as the Minister of Industry, under which he initiated industrial reforms and established the Biyagama Special Economic Zone. Wickremesinghe had competition from his senior colleagues in the UNP, Lalith Athulathmudali and Gamini Dissanayake, who had been rivals of President Premadasa. He was appointed the Leader of the House in 1989. On 7 May 1993, Wickremesinghe was sworn in as prime minister after President Ranasinghe Premadasa was assassinated by the Tamil Tigers and Prime Minister D. B. Wijetunga was appointed acting president. In the 1994 parliamentary elections, the UNP lost to Chandrika Bandaranaike Kumaratunga's People's Alliance (PA), and Kumaratunga was appointed Prime Minister of the country. Wickremasinghe was defeated in the race for Opposition Leader by two votes by fellow UNP member Gamini Dissanayake, who had re-joined the party. This gave Gamini Dissanayake the default leadership of the party and made him the presidential nominee of the UNP. The UNP was progressing well under Gamini Dissanayake's leadership, when he too was assassinated by the Tamil Tigers. Gamini Dissanayake's widow, Srima replaced him as the candidate of the UNP in the 1994 election. Securing just 35% of the vote, she lost to Chandrika Kumaratunga in all electorates except Mahiyangana. Afterwards, Wickremesinghe was appointed as the opposition leader as well as the UNP leader. In the 1999 election, Wickremesinghe was nominated as UNP's Presidential candidate. After a tense election campaign in the wake of the violent North Western Provincial Council election, the Tamil Tigers blasted a suicide bomb in an election campaign rally, in which President Kumaratunga lost her right eye. In the election held two days later 21 December 1999 amidst a wave of sympathy, Kumaratunga received 51% of the popular vote to be re-elected as Executive President. The gap between Wickremesinghe and Kumaratunga was approximately 700,000 votes (6% of the valid votes). Kumaratunga was sworn in for her second term as president on 22 December 1999. Prime Minister Ranil Wickremesinghe of Sri Lanka meets with Deputy Secretary of Defense Paul Wolfowitz in The Pentagon on 3 November 2003. The leaders are meeting to discuss defense issues of mutual interest. In the parliamentary general election 2001 UNF, led by Ranil Wickremesinghe, won 109 seats and PA was able to obtain only 77 seats. Consequently, he was able to form a new UNF government and sworn as the 17th Prime Minister of Sri Lanka on 9 December 2001. However Chandrika Kumaratunga still remained the President of the country. This led to a confusing situation where the President and the Prime Minister were from two opposite parties. Although, according to the constitution, both head of state and head of government was the President, Prime Minister Ranil Wickremesinghe was able to appoint his own cabinet and he had the actual control over the government. President Chandrika Kumaratunga also chaired cabinet meetings as de facto head, but her influence over decision making was strictly limited. He also requested international community to assist in development during the ceasefire which led to the Tokyo Donor Conference on Reconstruction and Development of Sri Lanka was held in June 2003 in which Sri Lanka received more than 4.5 billion dollars in reconstruction and development aid. During this time he proposed the creation of the "Western Region Megapolis" project. Planned with the assistance of architects and town planners of a Singaporean firm CESMA, it proposed to create a large city in the western province that can rival major cities in the world. However the project did not proceed after the fall of his government. Ranil Wickremesinghe's foreign policy during his tenant as the Prime Minister pushed closer relations with the west. He expected their economical backing to overcome the economic crisis. He also largely took assistance, especially from Norway, to resolve the ongoing Ethnic Problem in Sri Lanka. On July 2002 he was able to meet George W. Bush, the President of the United States during that period. It was the first time after 18 years a Sri Lankan leader met the US leader in the White House. This visit was primarily focused on building new relationships based on economical links between United States and Sri Lanka. Furthermore, US government pledged to support his peace efforts with LTTE. He also met the Prime Minister of the United Kingdom Tony Blair, the Prime Minister of Japan Junichiro Koizumi and the Prime Minister of India Atal Bihari Vajpayee. Many of these visits were focused on the issues regarding resolving the Ethnic Problem in Sri Lanka. Ranil Wickremesinghe believed a political solution based on a United Sri Lanka was the permanent solution to the Ethnic Problem in Sri Lanka. He also believed that such a solution could be reached through a peaceful negotiation process with LTTE. Three months after the election Ranil Wickremesinghe's government entered into a ceasefire agreement (CFA) with LTTE. The agreement was signed on 22 February 2002 at different locations in the war zone by both parties and Norwegian Ambassador to Sri Lanka Jon Westborg acted as the facilitator. It was said that the main objective of this agreement was to find a negotiated solution to the ongoing ethnic conflict in Sri Lanka. Both parties agreed to halt all offensive military operations. An international monitoring mission called Sri Lanka Monitoring Mission (SLMM) was formed to inquire into any instance of violation of the terms and conditions of this agreement. In the aftermath of signing CFA the island was deemed as a safe place once again, after decades of war. Specially tourism industry experienced a significant escalation where the number of tourists arrived to the country was suddenly increased. The A9 Highway was reopened up to Kilinochchi on 15 February 2002 after 18 years. Many checkpoints and roadblocks were removed in government-controlled areas. After the Oslo round of peace talks in December 2003, a concluding statement was declared by the Norwegian facilitators which later became known as Oslo Declaration. In this statement it was stated that "both parties have decided to explore a political solution founded on internal self-determination based on a federal structure within a united Sri Lanka". This was considered as one of the most significant incidents in the history of finding a political solution to the Ethnic Problem in Sri Lanka. After the 6th round of peace talks in March 2003 LTTE abruptly withdrew from the peace talks. However, in October 2003 LTTE again showed some intentions of entering into the peace process, calling for an Interim Self Governing Authority (ISGA). The proposal was handed over to the government through Norwegian Ambassador Hans Brattskar. The opposition and the nationalistic movements of the country strongly opposed CFA and the overall peace process of Ranil Wickremesinghe's regime. They continuously criticized and protested against CFA claiming it as a threat to the sovereignty of the country which ultimately leads the way to a separate state for LTTE, so called Ealam. It was later claimed by Karuna Amman who defected from the LTTE during Ranil Wickremesinghe's regime that the LTTE dragged the peace talks to smuggle weapons and ammunition including aircraft. Janatha Vimukthi Peramuna also decided to ally with PA to defeat the Ranil Wickremesinghe's government which they claimed as a threat to the sovereignty of the country. Consequently, President Chandrika Kumaratunga dissolved the parliament on 7 February 2004  which effectively ended Ranil Wickremesinghe's regime. In the 2004 Parliamentary Elections held on 2 April Ranil Wickremesinghe's UNF lost governmental office. Despite the expectation of a full six-year term, and planned projects cut short by the defeat, the UNP was optimistic that it could regain power in a future election. Within 14 months of UPFA's victory, the radical JVP wing's (composed of over 30 members) parting of ways with the government, left the UPFA's parliamentary composition well short of the required majority. He remained in the post of the Opposition Leader until 2015, when Maithripala Sirisena who sworn in as the President, appointed him as the Prime Minister. In December 2004, Wickremesinghe was chosen by the United National Party as its Presidential candidate for Presidential Elections due in late 2005. The Supreme Court decided in August 2005 that the elections should be held that year despite the President's argument that her term would end in 2006. Mahinda Rajapaksa, then Prime Minister, was nominated as the Presidential candidate of the Sri Lanka Freedom Party. In the Presidential Election held on 17 November 2005, Wickremesinghe was defeated narrowly by Mahinda Rajapaksa, who gained 50.29% of the vote to Wickremesinghe's 48.43%. A large number of the minority Tamil population in the Northern and Eastern parts of the country, who were largely expected to back Wickremesinghe were prevented from voting by the extremist LTTE, which had enforced a boycott of the polls. With the success in defeating LTTE in war, the government held a series of provincial elections in 2008 and 2009 for 8 provincial councils (Eastern, North Central, Sabaragamuwa, North Western, Central, Western, Uva, and Southern). In all occasions, UNP was soundly defeated by a large margin by UPFA. Of all the elections UNP obtained only 30% of the total polled and UPFA was able to gain 59% of the total polled. The margin was 2,527,783 compared to 180,786 in Presidential Election in 2005. Ranil Wickremesinghe, signed an Alliance Agreement with twelve other opposition parties in November 2009 and he announced that, a Common Candidate would be fielded for the Presidential Election which would be held in 2010. Later he announced that the former Army Commander, Sarath Fonseka has been selected as the common candidate and pledged to support him. UNP along several other parties and civil organizations signed to an Understanding Agreement and decided to field the then Secretary General of Sri Lanka Freedom Party, Maithripala Sirisena as the Common Candidate for the Presidential Election and the Common Candidate pledged to appoint Ranil Wickeremesinghe, as the Prime Minister if he would win the election. In the elections held on 8 January 2015, Common Candidate Maithripala Sirisena was selected as the 6th President of Sri Lanka and on 9 January 2015 when he was sworn in, he appointed Ranil Wickremesinghe as the Prime Minister of the Sri Lankan Parliament. Following the 2015 Presidential Election's United National Party-led common candidate Maithripala Sirisena having won 51.28% of votes and under Memorandum of Understanding agreement, Wickremesinghe was appointed as prime minister for the 100-day program plan and this is his third term as Prime Minister of Sri Lanka. Wickremesinghe vowed to regain majority in the Parliament and making it as the United National Party's Government, at the same time he also promised to secure the futures of younger generations and instantly confirmed that the Government will launch 1 million jobs for the youth as well advancement for the education and health sectors will maintain as promised. He also took steps to develop the former war-zones by touring the affected areas and met civil activists to discuss the issues faced by the Jaffna civilians and schools and to expedite investigations of missing persons. He also took steps to uplift Northern Province communities and to improve their standard of living. UNP/UNFGG-led by Wickremesinghe had won the General Parliamentary Elections held on 17 August 2015, making himself the Prime Minister for his 4th term, with 106 seats in 225-member Parliament of Sri Lanka forming the government (though short of 7 seats to secure the simple majority of the Parliament) defeating the political rivalry UPFA de facto leader and former President Mahinda Rajapaksa in his bid to return as prime minister after his defeat as president. Wickremesinghe also scored the highest preferential votes in the election with 500,556 votes, beating his common antagonist Rajapaksa by a considerable margin (with Rajapaksa garnering 423,529 preferential votes) whilst setting a new record as the candidate with the highest number of preferential votes in Sri Lankas' elections history. He also restarted the Megapolis plan which he started in when he was PM in 2001–2004. Surbana was consulted to revise the master plan to suit newer needs. The Ministry of Megapolis and Western development was created for project and the project which expects to convert the currently unplanned Western Province into a major megapolis by 2030 with an estimated population of 8.4 million and expects to solve the issues concerning traffic congestion, waste management and slum dwellers in urban areas. Wickremesinghe also showed interest in Surbana creating a similar plan for Trincomalee in the Eastern province and an agreement was later signed with Surbana for the purpose. He proposed major economic reforms and proposed a knowledge based social market economy which will be built on social justice principles that will also focus on the availability of global opportunities for education and strengthening of the health system to face health concerns of the 21st century. He also planned on reducing high income disparity levels in the domestic economy and increasing exports. He launched a plan to reform state-owned enterprise, enter into trade agreements with India and China to increase market access and regain GSP+ to regain EU markets, restructure key investment promotion agencies, develop tourism, attract high spending tourists, and develop the rural economy. Special economic zones and a special financial and business hub in Colombo were also proposed. He also organized the Sri Lanka Economic forum 2016 with the presence of international investor and Founder Chairman of Open Society George Soros and Nobel Laureate Economist Joseph Stieglitz and many other experts such as Ricardo Hausmann. The forum was seen as a boost to the Sri Lankan economy and during the forum Soros decided to invest in Sri Lanka the initial investments were expected to be around $300 Million. He also launched a loan and grant scheme for small and medium enterprises named "Swa Shakthi" empower rural entrepreneurs and develop the rual economy. However, in 2017, during his tenure Sri Lanka recorded just 3.1% economic growth rate, the lowest for 16 years. In February 2015 CBSL advertised the sale of Rs. 1 billion in 30 year government bonds at a coupon of 12.5%, though several accounts erroneously cite an indicative rate of 9.5%. The sale was oversubscribed with 36 bids totaling Rs. 20 billion. The majority of bidders, 26, bided for Rs. 100 million or less at a rate of 9.5%–10.5%. However, a few bidders, including Perpetual Treasuries Limited, wanted interest rates of 11%–12%. On 27 February 2015 the CBSL accepted Rs. 10 billion in bids at rates of 9.5%–12.5%. The issuing of ten times the advertised bonds, and at a higher than expected rate, was alleged to cost the Sri Lankan government an additional Rs. 1.6 billion ($ 10.6 million), though this was disputed by the Leader of the House of Parliament. A petition was lodged in the Supreme Court of Sri Lanka contesting the methodology used to allege such a loss. Perpetual Treasuries was issued, directly and indirectly, with Rs. 5 billion in bonds at 12.5%. Perpetual Treasuries was one of the primary dealers in the sale and is owned by son-in-law of the Governor of the Central Bank of Sri Lanka Arjuna Mahendran, who was appointed by Wickremasinghe. On 28 October 2016 the Committee On Public Enterprises, after a lengthy investigation, found Mahendran responsible for the bond issue scam and recommended legal action be taken against him. However, President Maithripala Sirisena announced that he had appointed a Special Presidential Commission of Inquiry to further investigate the case. The commission handed over the report on Central Bank bond issuance to Sirisena on 30 December 2017, and the Presidential Secretariat made available the full report in PDF form from its website for public viewing. During the investigation Wickramesinghe had to appear before the Special Presidential Commission of Inquiry. A group of ministers from the President's party along with opposition MPs failed in a recent attempt to pass a motion of no-confidence against the Prime Minister in Sri Lanka's Parliament. On 15 March 2018 Colombo Fort Magistrate’s Court issued an arrest warrant on Arjuna Mahendra on charges of criminal breach of trust for allegedly providing confidential information of the Central Bank of Sri Lanka to Perpetual Treasuries Limited. United National Party led by Ranil Wickramasinghe suffered shocking defeat in the 2018 local authority elections. They were only able to secure 34 councils out of 340 total councils. Mahinda Rajapaksa’s proxy Sri Lanka Podujana Peramuna won 231 councils. After the election defeat some MPs of UNP and party members asked Ranil Wickramasinghe to resign from the party leadership and Prime Minister position. Some media reported that President Maithripala Sirisena also urged Ranil Wickramasinghe to resign from his position leading into political crisis. If someone tries to break into my house, I can shoot. If he gets killed... Law allows me to do that. His foreign policy was seen as moving away from the Rajapaksa government's isolationist policies, which distanced Sri Lanka from the western world. His policies were seen to attract investments and financial aid. His government allowed a 99-year lease of a port to a Chinese company which caused protests in 2017. He also worked to develop relations with Japan and Singapore, choosing them as his second and third foreign state visits after being elected as prime minister. During his visit to Japan, he promised to support Japan's bid to secure a seat on the United Nations Security Council and entered to a "comprehensive partnership" with Japan covering political, economic and security issues. . During his visit to Singapore, in an interview with The Straits Times he invited Singaporean submarines and frigates to visit Sri Lanka. During the Rajapaksa regime which oversaw the rise of lawlessness and abuse of state power by Rajapaksa's government ministers and officers after the defeat of the regime, Prime Minister Wickremesinghe decided to set up high-powered responding Police Division so-called "Financial Crimes Investigation Division". This led to arrest Basil Rajapaksa the younger brother of Mahinda Rajapaksa and his political henchmen who were involved in large-scale corruption also were arrested within months after forming the committee. However several family members and friends of Rajapaksa were questioned by the FCID, Rajapaksa fears that his entire family and friends could be prosecuted and brought down to justice. Former President Rajapaksa asked President Sirisena over the pending charges against his family members and political associations to be dropped. However, President Sirisena refused to drop the charges that were ongoing, The meeting between President Sirisena and former President Rajapaksa ended up as unsuccessful over President's refusal to consider the key demands of Rajapaksa to be appointed as Prime Ministerial candidate and the charges against his family members and close associations to dropped. Rajapaksa's faction in SLFP criticised that the FCID were used as a tool to revenge on his associations and threatened to take legal action against FCID. In the evening of 26 October 2018, President Maithripala Sirisena appointed Mahinda Rajapaksa as Prime Minister after the United People’s Freedom Alliance withdrew from the unity government. He also informed Ranil Wickremesinghe was removed from office. Wickremesinghe said he refuses to accept the dismissal claiming that it was unconstitutional which triggered a constitutional crisis. Following rulings by the Supreme court and the Appeal court, Rajapaksa backed down and Wickremesinghe was re-instated at prime minister on 16 December 2018. Dr. Sarath Amunugama and Nanda Mathew were the first UNP members of parliament to crossover and joined the government in 1999 during Ranil Wickremesinghe's tenant as the leader of UNP. This was followed by Wijayapala Mendis, a veteran UNPer and a member of parliament since 1965, who joined the government in 2000. After the defeat in 2004 parliamentary election a senior member of UNP and a former minister of Ranil Wickremesinghe's 2001–2004 government, Rohitha Bogollagama switched sides and allied with government. Soon after the defeat in the presidential election in 2005 Mahinda Samarasinghe and Keheliya Rambukwella defected to the government. Both were former ministers of Ranil Wickremesinghe's 2001–2004 government and senior members of the party. Mahinda Samarasinghe was the government chief whip (2001–2004) and the opposition chief whip(2004–2006). Keheliya Rambukwella had gained the highest number of votes in 2004 parliamentary election from Kandy district. Following the controversy that resulted in the rejection of the UNP list of candidates for the Colombo Municipal Council election in 2006 that led to the UNP losing control over the Council after 50 years, prompted several senior members in the party to challenge Wickremesinghe's leadership and demanded his resignation as party leader. This group pushed to have Wickremesinghe replaced by the deputy party leader Karu Jayasuriya. However, this bid fell thought due to the lack of support from the majority of the party seniors. In 2007, Wickremesinghe established a memorandum of understanding (MOU) with the Mahinda Rajapaksa government agreeing to UNP's collaboration with the government on issues of national interest. However, shortly afterwards, 17 of the UNP's 60 members in parliament, including the group who had challenged Wickremesinghe's leadership, led by deputy leader Karu Jayasuriya crossed over to the governing UPFA ranks in parliament and were given ministerial appointments. The group consisted of senior members of UNP and many of them were former ministers of Ranil Wickremesinghe's 2001–2004 government: Karu Jayasuriya (Deputy Leader of UNP), M. H. Mohamed (former speaker of the parliament), Milinda Moragoda, G. L. Peiris, Bandula Gunawardane, Lakshman Yapa Abeywardena, Gamini Lokuge, P. Dayaratna, Mano Wijeyeratne, Rajitha Senaratne, R.A.D. Sirisena, Mahinda Wijesekara, Naween Dissanayake, Hemakumara Nanayakkara, R. M. Dharmadasa Banda, Neomal Perera and Chandrasiri Sooriyaarachchi. However, in late 2008, Jayasuriya crossed over once again to the opposition and was given back the deputy leader post. In February 2008, Wickremasinghe was once again under pressure to step down from the party leadership to accept an advisory position, from a majority of the UNP's parliamentary group. In March, the UNP working committee decided to create a new post called Senior Leader of the party and appointed Wickremasinghe to the post. This was amid discussion with the UNP's parliamentary group about the need for the Wickremasinghe to relinquish his post (of party leader) so that a new leader could be appointed. However, late March the party working committee decided that he should remain as the party leader. The defection of the party stalwarts to join the government continued thereafter: Susantha Punchinilame, Mahinda Ratnatilaka and Nandimithra Ekanayake who were members of parliament, a famous business tycoon and UNP Anuradhapura district leaderThilanga Sumathipala, a prominent UNP youth leader and a member of Western Provincial Council R. Duminda Silva, a former UNP member of parliament and a veteran actor Ravindra Randeniya, opposition leader in North Western Provincial Council Ashoka Wadigamangawa all allied with the government in different occasions. The most recent defection was the members of Parliament Johnston Fernando and Indika Bandaranayake joining the government. It is alleged that over 60 UNP MPs left the party during Wickremesinghe's leadership. It was alleged by the People's Alliance government that Wickremesinghe, then a Minister, was the political authority behind an illegal detention centre in the Batalanda housing and industrial complex outside Colombo between 1988 and 1990 which was allegedly run by a government-backed counter-subversive unit as part of the state's operation to put down an armed insurgency by the JVP. The People's Alliance government of President Chandrika Kumaratunga, appointed a Special Presidential Commission of Inquiry to investigate activities of Batalanda and on 3 September 1997 Wickremesinghe was summoned to testify before the commission. The commissions report was released on 12 April 1998. The commission was a fact-finding mission and had no judicial powers, however it recommended the government to "bring the guilty to book". One of its findings was that "Wickremesinghe and the SSP Nalin Delgoda, are indirectly responsible for the maintenance of places of unlawful detention and torture chambers in houses at the Batalanda Housing Scheme". It further stated that Wickremesinghe held "unauthorised meetings of police officers involved in counter-insurgency operations in the housing complex, and that as such, he had abused his authority". No criminal proceedings took pace thereafter. On August 2012, Minister of Health and SLFP general secretary Maithripala Sirisena alleged that during the 1994 presidential election campaign, all campaign details concerning the UNP presidential candidate Gamini Dissanayake were being secretly passed on to his opponent, Chandrika Kumaratunga by Wickremesinghe. Minister Sirisena made this disclosure while addressing an election committee meeting held at Siripura, Polonnaruwa. Sirisena asserted that he has ample proof to validate his claim and allegations. Consequently, both parties started to challenge each other for open media debates. Wickremesinghe was accused of being a dictator as the leader of UNP. The Mahanayaka of the Asgiri Chapter the Most Venerable Udugama Sri Buddharakkitha Thero once has said that since recently the Opposition Leader Ranil Wickremasinghe is acting like a dictator. On 2010, UNP MP Dayasiri Jayasekara accused in that within the constitution of the UNP Ranil Wickremasinghe is not a democratic leader but a dictator. Former minister and UNP MP Mahinda Wijesekara accused that "We don't need a dictator in the party" as Wickremesinghe opposed for the party reforms. Wickremasinghe married Maitree Wickremasinghe, Sri Lankan academic and Professor of English in 1994. Wickremasinghe has made several efforts to keep his private life out of politics. His personal life is rarely publicized or discussed. Maitree Wickremasinghe avoided the political spotlight until Wickremasinghe`s recent re election as prime minister in 2015. A number of members of Wickremesinghe's family are currently active in the government. His cousin's State Minister of Defence Ruwan Wijewardene, State Minister of Foreign Affairs Wasantha Senanayake and his aunt Sri Lanka High Commissioner to the United Kingdom Amari Wijewardene. He is a member of International Democrat Union. The IDU held a meeting in Sri Lanka in 2004 under his influence, when he was prime minister. ^ "Ranil Wickremesinghe appointed Prime Minister". Trade Bridge Consultants. Retrieved 21 August 2015. ^ "Ranil Wickremesinghe – Gentlemen Politician of 4 decades, alias mature leader of the people". United National Party. Archived from the original on 20 July 2015. Retrieved 21 August 2015. ^ "Sri Lanka election: shock as president Mahinda Rajapaksa concedes defeat". The Guardian. 9 January 2015. Retrieved 21 August 2015. ^ Ramachandran, Sudha (13 August 2015). "Sri Lanka's Elections: Rajapaksa Tries a Comeback". The Diplomat. Retrieved 21 August 2015. ^ "Prime Minister Wickremesinghe Calls For Buddhist Approach: Nikkei". AsiaMirror cloned Nikkei. 20 August 2015. Retrieved 21 August 2015. ^ "Regi Siriwardena dies at 82". ancestry.com. Retrieved 21 August 2015. ^ "Lankalovers". lankalovers.com. Archived from the original on 18 February 2005. Retrieved 21 August 2015. ^ "Prime Minister Wickremesinghe awarded an honorary doctorate". www.adaderana.lk. ^ "Sri Lanka: Former Prime Ministers". priu.gov.lk. Archived from the original on 24 September 2015. Retrieved 21 August 2015. ^ "Ranil Wickremasinghe is scheduled to take oaths as Prime Minister tomorrow | ITN News". www.itnnews.lk. Archived from the original on 6 January 2016. Retrieved 24 October 2015. ^ a b c "BBC News – SOUTH ASIA – Profile: Ranil Wickramasinghe". bbc.co.uk. Retrieved 21 August 2015. ^ "The Island on the net". island.lk. Retrieved 21 August 2015. ^ "A new era for Japan-Sri Lanka diplomatic relations". www.ft.lk. Retrieved 25 November 2015. ^ "What is the Singapore-styled Western Region Megapolis plan for Colombo? | Adaderana Biz English | Sri Lanka Business News". bizenglish.adaderana.lk. Retrieved 26 October 2015. ^ "Foreign Policy Annual, 2001–2009: Events". Retrieved 21 August 2015 – via Google Books. ^ "Ranil Wickremesinghe: The good, the bad or the ugly? | FT Online". www.ft.lk. Retrieved 6 June 2018. ^ "Sri Lanka Tourist Board Annual Statistical Report 2006". Scribd. Retrieved 21 August 2015. ^ "Web Page Under Construction". tamilnation.org. Retrieved 21 August 2015. ^ "The Island : Sunday Edition". island.lk. Retrieved 21 August 2015. ^ a b "Silence Breaks : Part Three – Ranil's Presidential Dream Crumbled Down – Natarajah Kuruparan". Archived from the original on 19 August 2016. Retrieved 8 July 2016. ^ "Use of cluster ammo not banned during war". ^ "US asked SL to use cluster bombs against Tigers". ^ "Abrogate CFA, ban LTTE says JVP". sundaytimes.lk. Retrieved 21 August 2015. ^ "Sri Lanka News - LTTE smuggled 4 or 5 aircraft during CFA: Karuna". www.lankanewspapers.com. ^ "Current Affairs". priu.gov.lk. Archived from the original on 24 September 2015. Retrieved 21 August 2015. ^ "BBC NEWS – South Asia – Sri Lanka leader sacks parliament". bbc.co.uk. Retrieved 21 August 2015. ^ "Department of Election". 3 December 2008. Archived from the original on 3 December 2008. ^ "Presidential election 2005, results" (PDF). Archived from the original (PDF) on 9 December 2009. ^ "Ranil new Prime Minister". DailyMirror.lk. 9 January 2015. Retrieved 10 January 2015. ^ "Parliament to be dissolved by April 23-Ranil". DailyMirror.lk. 1 February 2015. Retrieved 2 February 2015. ^ "PM continues Jaffna visit – addresses issues faced by schools". ^ "Probe on missing persons will be completed within 6 months: PM says in Jaffna". Archived from the original on 2 April 2015. ^ "Sri Lankan PM pledges to uplift Northern Province communities". ^ Subramanian, Nirupama (18 August 2015). "Sri Lanka parliamentary polls: Ranil Wickremesinghe's coalition edges ahead". The Indian Express. Retrieved 20 August 2015. ^ "Wickremesinghe Passes 500,000 Preferences From Colombo". AsiaMirror. 18 August 2015. Retrieved 20 August 2015. ^ "Work on Megapolis from 2016". www.sundayobserver.lk. Archived from the original on 15 October 2015. Retrieved 29 October 2015. ^ hermes. "Singapore to revise master plan for Sri Lanka's Megapolis". The Straits Times. Retrieved 26 October 2015. ^ "Megapolis Authority to be set up | The Sunday Times Sri Lanka". www.sundaytimes.lk. Retrieved 26 October 2015. ^ "Surbana Jurong to help develop Trincomalee in Sri Lanka". Retrieved 8 February 2017. ^ a b "Key highlights of Sri Lanka's Medium Term Policy Framework » The Nation". The Nation. Archived from the original on 10 November 2015. Retrieved 7 November 2015. ^ "Sri Lanka Economic Forum to kick off tomorrow » The Nation". The Nation. Archived from the original on 8 January 2016. Retrieved 11 January 2016. ^ "Soros presence seen boosting more foreign investment | The Sunday Times Sri Lanka". www.sundaytimes.lk. Retrieved 11 January 2016. ^ "Soros to boost Sri Lankan economy, Stiglitz to provide 'sound' advice' | The Sunday Times Sri Lanka". www.sundaytimes.lk. Retrieved 11 January 2016. ^ ""Swa Shakthi" to empower the rural community". Retrieved 8 February 2017. ^ "Sri Lanka's economic growth in 2017 fell to 16 year-low". menafn.com. menafn.com. 26 April 2018. Retrieved 15 May 2018. ^ "Advertisement by the Central Bank of Sri Lanka" (PDF). Archived from the original (PDF) on 19 February 2018. ^ a b c d e "CB Governor faces 'family company' charges; calls mount for probe". The Sunday Times (Sri Lanka). 8 March 2015. ^ a b "Harsha vows to go after fraudsters". The Nation (Sri Lanka). 8 March 2015. Archived from the original on 6 November 2016. Retrieved 26 October 2018. ^ "Sri Lankan central bank chief cleared over bond scandal". Mail Online. Agence France-Presse. 19 April 2015. ^ Aneez, Shihar (23 April 2015). "Sri Lanka c.bank head resumes duty after bond probe report". Reuters. ^ "Ceylon Daily News 8 July 2016". ^ "CB Bond Issue Call For Independent Probe". The Sunday Leader. 26 April 2015. ^ Fernando, Tharushan (24 May 2015). "Voice Against Corruption Movement condemns PM's statement on CBSL fraud". News First. ^ "Monk's petition on eve of bond debate in House: Sunday Times 22 Jan 2017". ^ Samath, Feizal (22 March 2015). "News Bond issue: Probe committee to question dealers on inside info". The Sunday Times (Sri Lanka). ^ "Primary dealers seek urgent meeting with CB on bond issue". The Sunday Times (Sri Lanka). 15 March 2015. ^ Shauketaly, Faraz (12 April 2015). "Trying To Stop The Third Force". The Sunday Leader. ^ Perera, Yohan (11 March 2015). "Finance Minister dismisses bond issue allegations". The Daily Mirror (Sri Lanka). ^ "Central Bank Governor under fire". The Sunday Times (Sri Lanka). 15 March 2015. ^ "The Central Bank Bond Fiasco". The Nation (Sri Lanka). 14 March 2015. Archived from the original on 24 December 2016. Retrieved 26 October 2018. ^ "Bond commission hands over report to President Sirisena". Adaderana. 30 December 2017. Retrieved 23 March 2018. ^ "PM before bond commission voluntarily". Daily Mirror). 19 November 2017. ^ hermes (6 April 2018). "Sri Lankan PM defeats vote of no confidence". ^ "SLPP wins 239 LG bodies, UNP 41". dailymirror.lk. dailymirror.lk. 11 February 2018. Retrieved 21 February 2018. ^ "SLPP wins 231 LG bodies, UNP 41". dailymirror.lk. dailymirror.lk. 11 February 2018. Retrieved 21 February 2018. ^ "Sri Lanka's ex-leader seeks fresh elections after council vote boost". reuters.com. reuters.com. 12 February 2018. Retrieved 21 February 2018. ^ "Ranil refuses to resign during talks with Maithripala". menafn.com. menafn.com. 13 February 2018. Retrieved 21 February 2018. ^ "Sri Lanka President's party decides to stay in unity government ending political crisis". menafn.com. menafn.com. 19 February 2018. Retrieved 21 February 2018. ^ "The empire strikes back: Rajapaksa triumphs in local elections, his shadow looms again over Sri Lankan politics". menafn.com. menafn.com. 19 February 2018. Retrieved 21 February 2018. ^ "Ranil Wickramasinghe's interview to Thanthi TV". 6 March 2015 – via www.thehindu.com. ^ Sri Lanka moving away from isolation Daily News, Retrieved on 23 January 2016. ^ "Sri Lanka port protesters doused by water cannon". 7 January 2017. ^ "Sri Lanka, Japan in "comprehensive partnership" deal: Ranil". economynext. ^ "Tying the knot with Japan". ^ "Sri Lanka to allow Chinese submarines to visit, says PM Wickremesinghe". ^ "SFB to probe large-scale financial crimes". ^ "Sri Lanka ex-leader's brother Basil Rajapaksa arrested". BBC. 22 April 2015. Retrieved 6 May 2015. ^ "Johnston remanded till tomorrow". Hiru News. 5 May 2015. Retrieved 6 May 2015. ^ "Mahinda Rajapaksa fears prosecution of entire family by new Sri Lanka government". IBN Live. 24 April 2015. Retrieved 7 May 2015. ^ "Sri Lankan president refuses to halt corruption probe". Shanghai Daily. 6 May 2015. Retrieved 7 May 2015. ^ "SLFP: Will take legal action against FCID procedure". DailyMirror.lk. 6 May 2015. Retrieved 7 May 2015. ^ "MoU in danger of collapse". sundaytimes.lk. Retrieved 21 August 2015. ^ "The Island-Politics". island.lk. Retrieved 21 August 2015. ^ Gamini Gunaratna, Sri Lanka News Paper by LankaPage.com (LLC)- Latest Hot News from Sri Lanka (27 February 2009). "Sri Lanka, 2 – 27 – 2009: Sri Lanka opposition leader faces further crisis in his party". Colombopage.com. Retrieved 20 September 2012. ^ "News.lk". news.lk. Retrieved 21 August 2015. ^ "Sri Lanka News - Duminda Silva joins Govt". www.lankanewspapers.com. ^ "Ashoka crosses over to UPFA". sundaytimes.lk. Retrieved 21 August 2015. ^ TamilNet. "TamilNet: 16.12.09 2 UNP MPs cross over to UPFA". tamilnet.com. Retrieved 21 August 2015. ^ "Ranil's Lack Of Honour". thesundayleader.lk. Retrieved 21 August 2015. ^ a b "Batalanda's ghosts return to haunt Ranil". The Hindu. 23 August 2000. Retrieved 20 September 2012. ^ "Batalanda and Ranil – lot of explanations needed". Asian Tribune. Retrieved 20 September 2012. ^ "The Sunday Times On The Web – News/Comment". sundaytimes.lk. Retrieved 21 August 2015. ^ "The Sunday Times News/Comment Section". Sundaytimes.lk. 20 August 2000. Retrieved 20 September 2012. ^ Report of the Commission of Inquiry Into the Establishment and Maintenance ... – Google Books. Retrieved 20 September 2012 – via Google Books. ^ "The Sunday Times Legal Column". sundaytimes.lk. Retrieved 21 August 2015. ^ "Batalanda's ghosts return to haunt Ranil". The Hindu. 23 August 2000. Retrieved 21 September 2012. ^ "News view". LankasriNews.com. Archived from the original on 8 May 2014. Retrieved 21 September 2012. ^ "VIDEO: Maithripala accepts Tissa's challenge". Adaderana.lk. Archived from the original on 8 May 2014. Retrieved 21 September 2012. ^ "The Hypocrisy Of Ranil". The Sunder LEader. 18 December 2011. Retrieved 21 August 2015. ^ "An Appeal To Ranil Wickremesinghe". The Sunday Leader. 23 September 2012. Retrieved 21 August 2015. ^ "EXCLUSIVE: Ranil is a dictator – Dayasiri". adaderana.lk. Retrieved 21 August 2015. ^ "'I will not apologise to Ranil' – Mahinda Wijesekara". Sunday Observer. 16 July 2006. Archived from the original on 23 September 2015. Retrieved 21 August 2015. ^ PM's Aunt And Leading Businesswoman Amari Wijewardena To Take Up Duties As High Commissioner In UK. Asian Mirror, Retrieved on 08 February 2016	. ^ "MIT CIS: Ranil Wickremesinghe Joins MIT". mit.edu. Retrieved 21 August 2015. Wikimedia Commons has media related to Ranil Wickremesinghe. "RANIL WICKREMASINGHE". Directory of Members. Parliament of Sri Lanka.